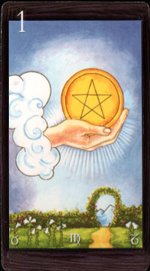 Ace of Pentacles suggests that there is a great opportunity for success and a chance to find a good and quite stable financial situation as well. Ace of Pentacles indicates a presence of the following characteristics in a person: desire for enrichment and indifference to everyday pleasures. This person has desire to live with a taste and for him it’s a dominant desire. If this card happens to appear when practicing divination on a situation, the Ace of Pentacles promises a success and receiving a good profit. In relation to the Major Arcana, Ace of Pentacles usually adds more ordinariness, depriving the Major Arcana cards from their spirituality and higher meaning, partly because it’s a material card. Ace of Pentacles symbolizes a delight, ecstasy, joy, excellence, perfection and happiness. Having this card in a spread indicates that this person may be moving straight to the top of the social pyramid. Ace of Pentacles mostly focuses on the following issues: career, professional skills, isolation from roots, perhaps a break between people, however, it also indicates finding new opportunities, an ability to look at the world with a new fresh vision. For politicians, artists and other people associated with public activities, the Ace of Pentacles will question their recognition. Ace of Pentacles can raise a person, but can also overthrow him. Pentacles are a material suit. Therefore Ace of Pentacles can mean money, income, recognition associated with wealth, a harmonious combination of materialism and spiritualism. This card can indicate a beginning of a situation or a process that in the future, perhaps will lead to fame, money and recognition. Ace of Pentacles can also mean any event associated with health. This can be either a disease or healing. Pentacles are a suit, which symbolize the balance of power. Thus the issues of health (illness) will be based on harmony or on achieving it. Growth failure, infertility, lack of income, wealth without happiness, prosperity, satisfaction, health, which is spent in vain, wasting money, insatiable thirst.